Today's post is Simple - a simple card, crisp and clean, straightforward. Entirely unlike my week this week. 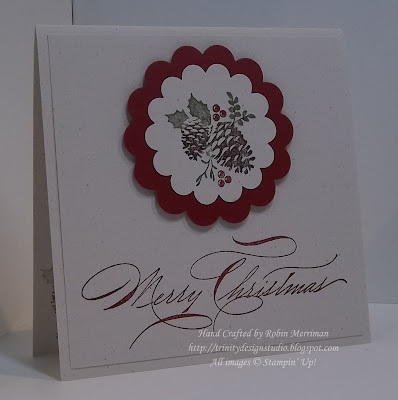 This was one of the cards we made at my Christmas in September class this month. It's a finished size 4 1/4" square card. I used Naturals White cardstock for my base and panel. The panel is 4" square and I stamped that gorgeous Merry Christmas greeting from the Hand-Penned Holidays stamp set in Cherry Cobbler Classic Ink. The focal point is simple too. A piece of Cherry Cobbler cardstock punched out with the 2 3/8" Scallop Circle Punch. I inked the pinecones image from the Pines and Poinsettias stamp set with Cherry Cobbler, Always Artichoke and Early Espresso Stampin' Write Markers and stamped it on a piece of Naturals White cardstock. It's punched out with the 1 3/4" Scallop Circle Punch. Those layers are adhered together, then popped up on Stampin' Dimensionals on the card front. On the inside, I stamped the second generation image from the focal point in the lower left corner for a soft accent there. This one is very easy to mass produce yet still look lovely. You can add Dazzling Diamonds glitter to the pinecones for some bling that would step it up a bit yet still keep it simple. Quite unlike my life this past week. I won't go into details, I can't. Lets just say that I've been challenged this week in every possible way. I feel like what I think a losing prize-fighter feels like after going 15 rounds with George Foreman. And I am more grateful than ever for my faith that comforts me and the arms of my Jesus that I can run to and rest. I know that many of you pray, and you have prayed for me in other times of trial. Friends, I need your prayers again now. We all have times when life just hands us a big bag of doo-doo that you don't want and don't deserve and completely blindsides us. I know that it's through these times that we learn and grow and draw closer to the Lord, but everything in me wishes He would choose a different way. In my 47 years, I've certainly gone through trials before and learned a LOT; and yes, I do know that if it wasn't this, it'd be something else - perhaps even more painful and hard. Sigh. We don't get the leisure of picking and choosing our trials - I guess if we did, we'd never choose anything that truly creates life change - but there are some things that I just wish God would leave on the shelf for me. So, this leaves me praying for peace, praying for healing from the hurt, and praying for His will to be done and that He would receive the glory in it all. I don't know if any of you are experiencing painful testing right now, but if you are, feel free to message me - I will pray for you friend. In the meantime, I'm sharing a song that has ministered to me - perhaps it will to you as well. The picture doesn't change in this video, but it's the words that will bless you - so just listen. Hi Robin. I'm sorry for whatever trials and tribulations you are going through, but i'm sure your strong faith will guide you through. In the meantime, this is a gorgeous card! I really do like clean and simple best, and this one is so elegant! Robin, I too am very sorry for your trials and hope God will lead you through them quickly! Other than the prayers, is there anything else we can do? You are in my heart at this time difficult time for you. You are so wonderful to share your many talents on your blog. Now those of us who look at your blog can share our hearts with YOU ! !